At Free Bird Innovations, we are focused on providing products with the highest levels of customer satisfaction we will do everything we can to meet or exceed your expectations. Our Mission is to make it simple for our customers to achieve their dream of flight. 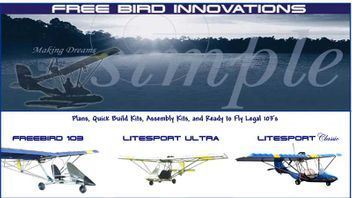 We have been building ultralights and experimental planes since 2003. We can build just about anything but some parts just make sense to buy from someone can do it better, faster, and cheaper. When it came to buying brake systems we became frustrated that we could not find a system that was light enough, with good performance, and was cost effective. That's how the Black Max Brake systems were born. I love it when i get a call from a customer that calls up just to tell us "do you know how great these things work" and they proceed to tell us there story step by step. We ask is there anything we can do for you? They respond with "no, i just had to call you and let you know how pleased I am and how amazed I am with the performance."